It's been a while since I have done a DIY Saturday. My morning has been filled with DIY searches and projects added to my lists. so I made my own version! This project was easy but took some time because of dry time. Now, if you have never frequented an IKEA... things to know... make a day or at least a half day of it. Wear tennis shoes, no heels. They have concrete floors and there is lots of walking. Be ready to assemble almost anything you buy. That being said, this box was something I did assemble. 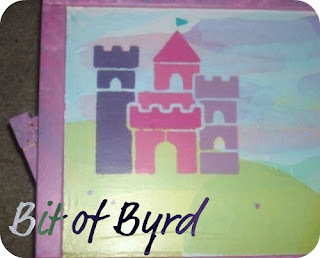 The pieces of wood were painted with regular acrylic paint from the craft store. 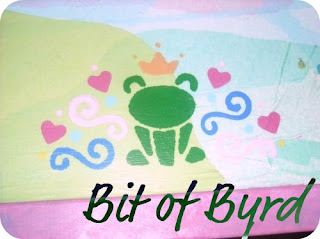 I used 3-4 different colors and a sponge applicator to put on the colors. You can obviously customize this for a boy also by changing the colors. The pieces of wood that were not attached to the white laminate were painted before assembly. To paint the parts that are attached to the white laminate (the lid) i tapped off the white. After painting everything got 2-3 coats of mod podge. For the sides and the top, those are all designs made with tissue paper. 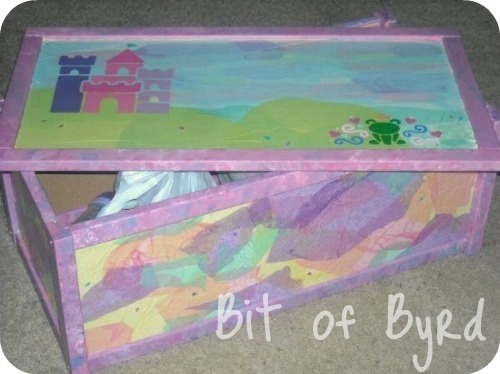 I put down a layer of modge podge, put on the tissue paper, then another layer. On the lid I did several layers to achieve a hill setting and the look of the sun set. I let that dry a few days. I actually used the colors from the border in the castle. and then hand painted little lady bugs on the top and sides of the box. I took my time and I would say the box took a week to two weeks to complete while I made time for it when watching tv. The lid is light, and my niece (who is now 2) knows that is where her toys are when at my mom's house and can easily open and close it. 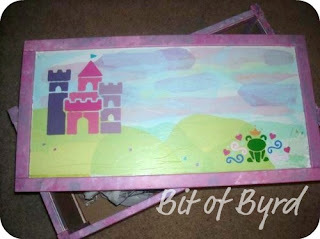 I know I said it was my version of a princess box and there are no princesses... But Disney didnt create the princess. If you need a Disney princess, they mod podge one on there, or any other favorite character or theme. Before I knew it would be a niece and not a nephew I was thinking of painting it to look like it was made of Legos. That would be a cook idea too! I figure why rush it... the longer it takes the more love it has and the more you will appreciate it later when you see it being used. and what made me think to post a project I have almost no pictures for from more than 2 years ago? I saw it being used by my niece and it made me smile. Update: Apparently the use of an Ikea item and changing it is often call an Ikea Hack in the craft world. Who knew... I'm a hacker!